With so many languages available on the internet, the question about whether to translate or localize your website lingers at the back of many website owners. For some years now, the English language dominated the internet. The dominance has been relatively historically and is still is. However, there is a massive representation of other languages apart from English on the internet. The idea of multiple languages is fast changing the way websites operate now more than ever. Businesses and individual from all over the world should consider translating their websites. Translating your website is one a great idea you should consider in 2018. There are many benefits of making sure your site is accessible in more than one language. To make things easier for everybody, there are language translation tools that can be used to translate your websites. You can download them from the internet for offline use and use them online, whichever works for you. 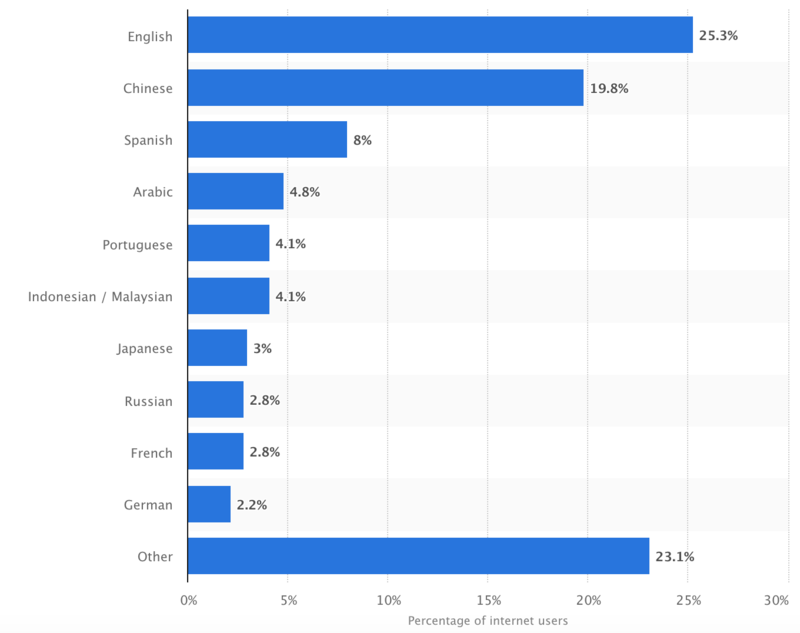 To help you understand better the languages used on the internet, here are the top languages used according to Statista statistics. According to Statista statistics, English is the most represented language online. The English language has 25.3% of internet users worldwide. This is not a surprise as English has been dominating the internet languages for many years. It was the founding language of the internet, after which means most contents are in English then translated the language of your preference. It is assumed that Chinese is the fastest growing language in the world and going by the Statistics, it is true. Chinese take the second spot with 19.8% internet users using it. With a population of 1.35 billion and other people still learning the language, it deserves a second place on the log. It’s better to translate your website using language Translation tools found online to make your website accessible to Chinese speakers. Believe it or not, there are more than 750 million people who speak Spanish worldwide. Around half of them are native Spanish speakers. This means if you want to access this population your need to translate or localize your website. The content chased in Spanish in ever growing. Spanish speakers are becoming more connected which means they need more content in their language. Statista places Spanish at number three with 8% of internet users using Spanish. The ranking is expected to grow in the coming years. Arabic was just a small language several years ago used on internet. In 2015, it did not feature even in the top ten languages used on the internet, but has grown to become one of the most used languages online. As of 2013, only 37% of Arabic speakers were connected to the internet, but today there are more than 168.1 million Arabic internet users worldwide. The language just misses out on the top three spot, but it is worth a try to translate or localize your website in Arabic. Just like Arabic and Spanish, Portuguese content online has grown since 2011. In 2013, only 47% of Portuguese speakers connected to the internet, but things changed as time went by and now there are a whopping 131.9 million Portuguese speakers connected on the internet. This means at least 4.1% of Portuguese speaking people use the internet. Although the language may seem like a donkey in the race of horses, it manages to come fifth. No one would believe these languages would take the sixth spot on the list. With more than 98.9 million users online, it is worth to translate your website to Malaysian/Indonesian to access them if they are your target group. You can also consider to translate or localize your website to these languages as these people want to find more information about foreign products and services. Use language Translation Tools. They offer better services. Japanese has been on the list of the most popular languages used online on internet since the year 2011. Similar to Spanish, the Japanese speakers are creating an amount of content online. However, there is much room for growth. Localizing your website to Japanese means more traffic, business and an increase in your ROI. 3% of internet users are Japanese which translates to 114.9+ million users. The Russian language has grown considerably with 103.1+ million users online. It is seventh on the log since more people are using it to access content on the internet. In 2011, the population of Russian speakers accessing the internet increased at a rate of 41.5 percent and its still in the increase mode. Top language translation tools can help you translate or localize your website to the Russian language. Now to the language that most people would have thought would take to top five on the list of the top languages used online. French surprisingly has a decent share of website users, considering the fact that it’s an official language of 29 countries and France being notoriously known for its effort of preserving the French language. However, it is ninth on the log with approximately 2.8 internet users. According to Internet World Stats, German was the tenth most common language used on the internet in 2015. The statistic has not changed much. Statista recent statistics show German as the tenth top language used online with 2.2% of internet users. It’s easy to translate your website using language translation tools found online and you will be able to access German-speaking people who use the internet. Translating or localizing your website offer an opportunity to reach a wider audience. For instance, English language websites gear US audience and other audience around the world, but if you are targeting people from different communities and culture, you will be more successful by translating your website into multiple languages. Depending on your geographic area and target audience, you can decide to translate or localize your website. It is an important aspect of your marketing strategies because it allows you to reach specific audiences who speak different languages. Use the already available language translation tools found on the internet. Fast, reliable and cost-effective translation services. Receive the highest quality with fast turnaround from the best professional translators. Order your translation now.